Earth Heart Inc contacted us and asked us if we would be willing to try their products for a review. After assessing their product line, I chose Buzz Guard bug spray, and Canine Calm, a calming essential oil. Living in Maine, choosing the bug spray was a no-brainer. I live in Maine! ‘Nuff said. As a trainer and foster home to a revolving door of dogs, I also looked forward to trying the essential oil comfort spray. Let me start by saying that my testing involved observation only, and I passed the products around to several specially selected friends. It was quickly apparent that this bug spray helped keep insects at bay. Having reviewed the ingredients, we felt safe using it on us, our pets and our kids. We tried the bug spray one day at a friend’s farm. The Buzz Guard kept swarms (and we are talking swarms!) of Black Flies off of us, the horses, goats and dogs for close to 4 hours. Here in Maine, we are world famous for our black flies you know. If you have never had the pleasure of meeting one, let me see if I can paint an accurate picture. They are small. They are nasty. They come in swarms and when they bite, it leaves a nasty burning welt that often lasts at least 24 hours. Buzz Guard is made of essentials oils and neem seed oil, all of which are safe for people and pets. The product is safe for pups as young as 9 weeks. I am thrilled to have found a product to use on my kids and pets that does not include harsh chemicals. Thankfully black fly season is but a nasty memory at this time of year, but it also helped with mosquitoes and other biting flies. I toyed with the idea of saving this review for spring, but not all of our readers live in the Northeast. We tried it in the woods for ticks, and we did not pick up any on the days we walked with the dog sprayed: that of course is anecdotal, and we don’t pick up ticks every time we hit the trails. The effects of the Canine Calm Spray were not as obvious. Canine Calm contains pure essential oils from plants such as lavender, geranium and tangerine. Throughout history these remedies have been used for relaxation. To test it, I sprayed it in my car when I picked up several new foster dogs. I also sprayed down their bedding, and as per instructions massaged them with it a few times. For good measure, I also sprayed my pant legs and their leashes. In all cases I found there was no way I could say for sure, but because there has been extensive research on the use of properties such as lavender and it’s calming properties on dogs, I have decided to incorporate essential oils as part of my routine with new, and fearful dogs. It is impossible to accurately measure, but I feel it can’t hurt. The dogs I tried it on all came around quick. I am also upping my use of essential oils around the holidays. Holidays are times of great stress for pets. Visitors, change of routine, travel…all these things are upsetting to dogs and the use of essential oils may help dogs to cope a bit better. I would like to add that both products smell amazing! I had to hide the Canine Calm from my high school freshman daughter who used it daily at the start of the school year before leaving the house! In hindsight, maybe the Canine Calm helped her breeze into a new school. Earth Heart has a two for one deal for a very limited time. Receive one free product with your online order during the Thanksgiving holiday weekend, November 23-27, 2011. Order one or more Earth Heart products, and in ‘special instructions’ or ‘note to seller’ at check out, enter ‘LWD Thanks 2011’ and be sure to include the product name you wish to receive FREE with your order. If you would like your product to appear in one of our weekly reviews, please email us at [email protected] We are most interested in training aides and products that improve the lives of dogs and their people. 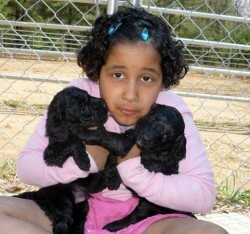 What I love are the three curly headed cuties pictured in your article!! I like lavender for myself too…I never thought about it for dogs! Earth Heart is extending the Thanksgiving promotion to help you get a jumpstart on your healthy holiday. Order one or more Earth Heart products by December 10th, and in ‘special instructions’ or ‘note to seller’ at check out, enter ‘LWD Thanks 2011’ and be sure to include the product name you wish to receive FREE with your order.